Some 12 years ago, Guy Borden had an idea he couldn’t shake – to start a small, organic farm in rural Delta County.On one level, the notion made sense. Borden was driven by a desire to provide himself with the produce – especially the tomatoes – his grandmother had served up during his Oklahoma childhood. Not satisfied with the fruits and veggies sold in the supermarkets on Colorado’s Front Range, where he had moved, he found himself driving to the farmland plains of Eastern Colorado in search of fresher, tastier food. With his own plot of land, Borden figured, at the very least he could feast on decent tomatoes.On every other level, the plan made no sense at all. Borden had spent his professional life as a carpenter – raising custom homes in Colorado ski towns, with no background in raising crops. His early research showed that most of the farmers in Delta County, even those who had massive spreads of 15,000 acres, had mighty financial struggles. Some were failing as business ventures. On top of that, the business model that Borden envisioned simply didn’t exist, at least not in rural Western Colorado. His idea was to sell retail, directly to customers. But unless he was thinking of a lonely roadside stand at the edge of his farm, there was no system connecting farmers to consumers. When Borden opened his Borden Farms at Pea Green, in 1995, there was one farmers’ market he knew of anywhere in the region – in Montrose. A dozen years later, Borden seems, if not a genius or visionary, at least a happy, comfortable – and busy – man. Since the mid-’90s, farmers’ markets have proliferated like weeds. The Ridgway market, on the Ouray County Fairgrounds, started up in 1995; in short order followed markets in Edwards, Vail, Basalt, Carbondale, Glenwood Springs and Telluride, occupying space in school parking lots, downtown streets, and parks. Also established in 1997, with six vendors, all selling produce, was Aspen’s market. Now known as the Aspen Saturday Market, and occupying two blocks of downtown every Saturday from mid-June through October, the bazaar features regionally grown fruits and vegetables, meats raised and packaged on the Western Slope, wines made from Colorado grapes, and Roaring Fork Valley brownies, clothing and crafts – more than 50 booths in all. Apart from a place to shop, the market has become a meeting place, perhaps the most inclusive social scene in Aspen. The Aspen market is one of six where Borden Farms is represented. Guy and his wife and their daughter, plus workers hired by the day, sell peaches, apples, potatoes, onions and more in markets from Telluride to Edwards. Borden says it is a modest living but, like a lot of his fellow farmer/retailers, he thoroughly enjoys the life of planting and harvesting, of talking to and educating consumers. And he’s doing better, on 10 acres, than most of his neighbors running industrial-sized farms on land a thousand times bigger.”The neighbors,” said Borden, an engaging 57-year-old who is in his first year at the Aspen market, “were all big, conventional farmers and were struggling, some failing, selling to big buyers, the Wal-Marts. I constantly heard they were getting beat down on price.”Our model was to go strictly retail. We had no idea what it would take to make a living. But I had a burning desire to do it.”And Borden’s got his tomatoes, from irregular shaped, uncommonly colored heirlooms to tiny, yellow cherry tomatoes. He is particularly proud of the latter, insisting I taste one. His daughter made sure I picked one that looked perfect, and sure enough, it was as sublime a tomato experience as I, a tomato fanatic, have ever had. A great tomato is a wonderful thing, and a worthwhile goal, in itself. But the growth in farmers’ markets holds the possibility of improvements beyond just good-tasting fruit.The world’s energy crisis has arrived as a hard fact of 21st-century life; the debates now center around how to address it. Ditto for climate change and the myriad tragedies – flooding, loss of species, instability in crop-growing regions – that may come with it. Suburban-style sprawl is a blight on contemporary existence, from aesthetics to the automobile traffic it causes. Despite our out-of-whack expenditures on health care, health issues – especially, it seems, diet-related ones like diabetes – are becoming more acute. Something of a newcomer to our daily list of perils is the food stream; an edition of The Aspen Times this past week carried stories on packaged salad (bearing the brand name “Hearts Delight”) contaminated with the E. coli bacteria, and a disease that is killing off cultivated pigs in China. Solutions to the above threaten to be expensive, painful and a long way off – assuming solutions exist at all. The last thing anyone expects is that addressing these issues will be rewarding, even fun. 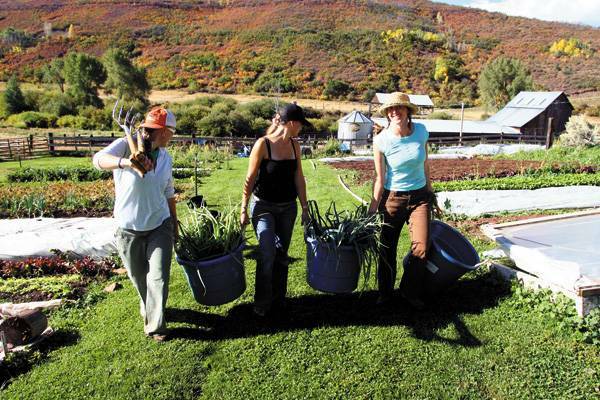 But farmers’ markets are a step toward tackling those problems – and in the process, Aspenites can mingle with their neighbors (and meet new people from that faraway land beyond McClure Pass), trade recipes, and learn about an essential subject – agriculture – that seems to have slipped by a generation or three. Meanwhile, their kids roam the market sampling lollipops made from all-natural honey, and brownies made three miles down the road.It may not come cheap, exactly; produce at the Aspen Saturday Market can cost twice what City Market charges. But the trade-off in quality and freshness can be huge. And if buying produce from a farmer inspires someone to cook at home rather than eat out in Aspen, then a farmers’ market becomes a bargain. Interestingly, the reason many of the farmers got into the business of farmers’ markets wasn’t about saving the world. It was about improving their own lot in life, spurred by the entrepreneurial dream to own a self-run business.Jack D’Orio, for instance, had spent years scrambling for his living, farming land owned by others and working as a crop extension agent for Colorado State University while also tending his own crops, originally in Eagle County. He consolidated his operation by buying a farm in Paonia, with the intention of reaching customers himself, by whatever means possible.But D’Orio preceded even Borden into the role of farmer/retailer, and found the economics of the model back then challenging. So in the late ’90s, D’Orio organized six regional growers and convinced the city of Aspen to close a downtown block for a few hours on Saturdays during the growing season. His business operation is now a simple one (if you put aside the fact that D’Orio runs the six-acre, organic farm basically on his own, a job description that has a staggering variety of chores): Virtually all of his crops are sold at the Aspen Saturday Market, where he pulls in up to $4,000 a day.”I was trying to prove I could make a living off 10 acres. It was my feeling, if we increased the clientele, we could survive off that,” he said. “And we’ve proved that. A lot of people said, if Jack could do it, we can do it. I’m proud that a lot of little guys are able to get up and do something.”For Peter Forte, who has owned Forte Farms in Palisade, near Grand Junction, for 35 years, being the little guy is not a preference, it is the only means of survival. “I couldn’t be in business if I was bringing it to the shed – having someone else pack it for me and bringing it to the market,” said Forte, who, with a presence at 20 farmers’ markets, including Aspen’s, is one of the bigger guys in his end of the business. Forte pointed out that over a third of his crop would be rejected by distributors, who are looking for perfect fruit to place on supermarket shelves, whereas farmers’ market customers have a higher tolerance for blemishes. He added that wholesalers have been known to bully farmers with take-it-or-leave-it payment terms. And cutting out middlemen roughly quadruples the price Forte himself is paid for his fruit.”If I didn’t sell at a farmers’ market, then I’ll sell [the land] for something else,” he said. “I’ll cut the trees down.” Forte’s implication is clear: If not for farmers’ markets, his farmland would almost certainly be bulldozed in favor of development. Jeffrey Isaacson is neither a farmer nor a rancher. But like the growers whom he works beside at the markets in Aspen and Carbondale, he is guided by the values of the farmers’ markets – that locally grown goods are worth any extra effort and money; that there is a premium in having direct contact between those who produce the foods and those who eat it.Isaacson’s product, Jeffreezz Aspen Sorbetto, served at the markets in Aspen and Carbondale, is a unique concoction that comes in flavors from peach and cherry to vanilla and jalape&#241;o. Customers often mistake it for ice cream or an Italian ice, but Isaacson uses neither cream nor ice to make his sorbetto. Instead, it is primarily fruit and honey, with some sugar and other flavors.